In today’s transport industry, especially in the aviation sector, the players are coming up with restrictions on the amount of luggage one should bring on board when traveling. Over half of the world’s major airlines have increased their baggage fees to tame their customers from carrying too many items on travel. Imagine how frustrating it is to find your air ticket with check-in fees for not abiding by the weight restrictions of the given airline. Surprisingly, not many travelers are aware of the weight limits, with the airlines working tirelessly to keep their clients in the dark regarding such travel restrictions. It is, therefore, important to monitor the weight of the luggage you drag along to a given journey to avoid such extra charges. For a frequent traveler, a digital luggage scale comes in handy hence saving you the blushes in a busy airport. Most airlines have pegged their weight restrictions at between 15 pounds and 50 pounds. Your luggage scale, an accurate easy to handle device can help you stick to the acceptable weight limits. Some general knowledge would help you plan your travel and even save you time at the airport. Measure your luggage before flying to beat the airport scales that can at times be inaccurate while also saving you the stress that comes with maneuvering around airport aisles. A perfect luggage scale is usable on anything you can pick by your hand, for example, your backpack before you go on a trail. A bicyclist can use the electronic luggage scale to measure their bicycle’s weight before going for a race. The portable scale can gauge the weight of your fish, when on a fishing expedition. A digital luggage scale is better than the floor scales most families us to weigh their luggage before travel. It helps households avoid carrying unnecessary luggage, ensuring you only bring along less but helpful staff for your next trip, lessening your impact on the environment. Below are some of the best luggage scales in the market today. 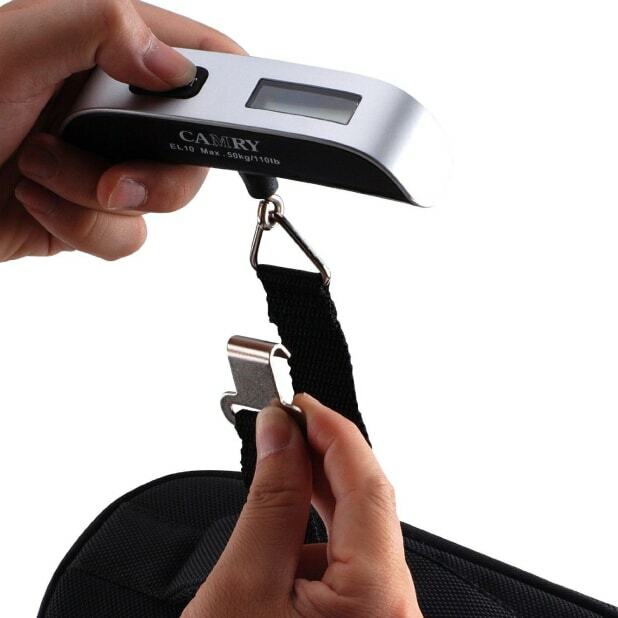 Camry luggage scale is a smooth, lightweight digital scale that measures anything up to the weight of 110 pounds or 50 kilos. At only 3.2 oz., Camry is designed from stainless steel and plastics, ensuring that it is a durable device for frequent travelers. Camry is one of the easiest devices to store meaning that it is carried around conveniently. It has a rubber paint handle, hence offering one of the most comfortable and sturdy grips in the first place. You can measure your luggage conveniently, anywhere and when required using this device thanks to the zero and tare function high precision weight sensors. It offers one of the most reliable and accurate readings through its 1.4″ LCD. Two simple buttons control it. It zero reading is 0.1 lb. A 3-volt cr2032 lithium battery powers Camry’s display. To prevent overloading and use of a little battery power on the scale, Camry comes with an overload and low battery indicator. It has a 2-minute automatic shut-off feature. The Camry luggage scale is an easy-to-use device. You only have to unravel the black strap, and then remove the plastic battery stop. Proceed to slip the handle or size strap then clip back over the triangle ring. Power on the device, and wait for about two seconds for the zero read. Lift the luggage and hold the device, until the display flashes thrice. You now have the exact weight of your baggage. Camry scale comes with extra features to enhance its usability. There is the temperature display, for Fahreints and Celsius, which works hand in hand with a built in portable travel thermometer. A Camry’s scale manual is always there to guide users on how to use the device. Camry’s scale is one of the cheapest scales in the market, going for USD 8. It is a must-have gadget for frequent travelers, assuring them of money back guarantee. EatSmart Precision scale offers on of the practical solutions when it comes to measuring your baggage to abide by airline luggage restrictions. The device comes with a two handed Smart Grip design, to ensure that you can lift the heaviest bags off the ground easily. It supports a weight capacity of 110 lbs. or 50 kilos, with a graduation of 0.1 pounds. It comes with an easy to read large backlit LCD, conveniently placed on top of the scale’s handle. The display offers an easy reading as it is placed directly in the line of your sight hen lifting the bag. An extended life battery perfectly fits into the scale’s solid body offering an overall sleek design in the end. The EatSmart device is easy to use. Push the ON/OFF button to reset the gadget to zero reading. Proceed to attach the suitcase to the strap of the scale. Lift the bag off the ground by holding the scale with both hands. Take the reading on the LCD digital display. One perfect thing about this scale is that it offers on of the most accurate readings, in the first place. Most customers have liked the device, as it is most likely going to provide 0.1-kilo error with the airport scale. It goes a long way into saving the traveler from the hefty overweight baggage fees. EatSmart scale carries with it satisfaction guarantee from its maker and it goes for USD 13. Digital Luggage Scale Dunheger 110 Lb. 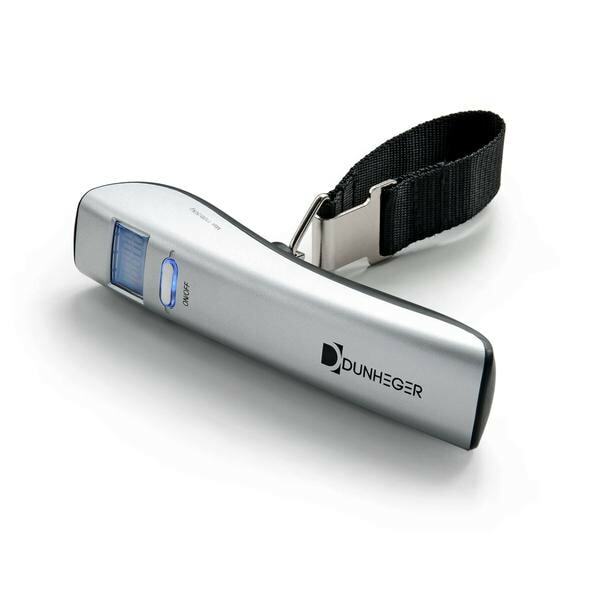 When it comes to convenience and practicality, Digital Luggage Scale Dunheger is your to-go-to device. It is the scale’s recognized as the 2016 Official Golden Globe Awards Celebrity Gift Bag. It doubles up both as home and commercial business scale thanks to its sturdy construction with only a weight of 4.8 ounces. It has a large backlit LCD digital screen that offers a bright display when it comes to taking the weight of the packages the scale weighs. It has two buttons; power on/off button and the other one used for switching in between pounds and kilos, before taking the weight of your suitcases. The display automatically powers off after a minute, saving your gadget from battery drain in the end. It perfectly fits in the palm, offering a good grip when needed to lift a heavy baggage. You will enjoy an accurate and precise measurement of suitcases of up to 110 lbs. Additionally, there will be a quick reading on the weights of theses bags, in pounds and kilos, thanks to the easy display. It comes with an auto pressure lock and sound indicator to alert the owner when to take the weight of the bag. After this, you can easily tuck it in back into your suitcase then hit the road. Some of the extras travel accessories Dunheger comes with include; an e-guide which offer great travel tips and tricks, a carrying pouch to help you store your digital scale, a beautiful gift box and a pair of AAA batteries, to save you additional purchase. For USD 12.99, you got this device in your hands hence enjoy years of service in the end. If you are after getting high accuracy readings for your heavy baggage, then Etekcity is here for you. With a capacity of 110 lbs. and a precision accuracy of 0.1 lbs., you will be sure of beating the extra charges that come with carrying excess weight to your cruise or flight. Moreover, it is one of the most affordable digital scales on the market, assuring you of longevity, thanks to its sturdy construction in the first place. For natural lift and sturdy grip, rubber paint technology is used to design the scale. There is also a utilized textured handgrip and a strap where you hang your baggage. Etekcity Digital weighing scale allows travelers to measure their suitcases’ weight anywhere at any time, hence the scale’s convenience. You need not strain when using this device. Simply hook your baggage onto the durable steel hook, and in a matter of seconds, the LCD digital display will give the results. You can also us the tare feature, which allows travelers to easily measure the weight of the individual object as they embark on packing items into their or bag packs. Etekcity Digital scale comes with a thermometer, capable of taking temperatures in both Fahreints and Celsius. It allows you to access the current temperature readings in the luggage to help in the preservation of delicate items like souvenirs from extreme temperatures. After using this gadget, only turn it off; slide it into one of the small pockets in your luggage. With a total weight of 0.8 ounces, you are sure of not adding any extra weight to your suitcase. 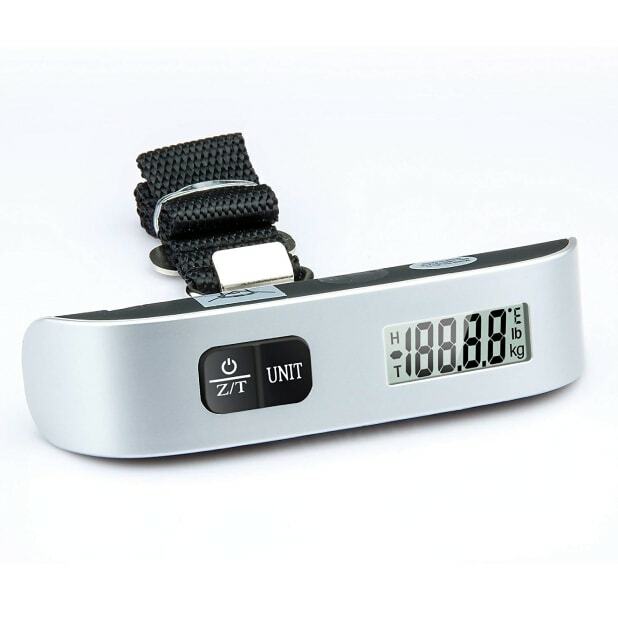 It makes it a perfect itinerary for any traveler, not mentioning that it only cost USD 7.99 to have your hands on this durable and heavy-duty scale. Traveling is easy and convenient thanks to this new fashionable stainless steel scale. It is one of the lightest, accurate and reliable gadgets in the travel industry. It has a small weight of 3.3 oz and goes a long way into saving you the sting of extra weight charges before your cruise. It has an easy to read LCD digital display, saving you the strain that comes with getting the readings. However, it lacks a backlight screen, which is a crucial feature in the first place. Only lock the suitcase to the strap, weight for a few seconds for the bag to be stable, while the scale captures the weight of the bag. If the packet exceeds the allowable weight limit, a capacity overload indicator will blink. Tarriss Jetsetter ensures that travelers are not let down by dying batteries. There is a low battery indicator to alert owners when the device needs new batteries. However, the batteries for this magnitude are the CR2032, which are expensive and sometimes hard to find, unlike the two AAA batteries. Tarriss scale comes with a lifetime warranty, and the batteries are covered here, so be sure of using the batteries for long. Tarriss Luggage Scales come with a link inside their packaging, where travelers can download a PDF on travel tricks and tips. 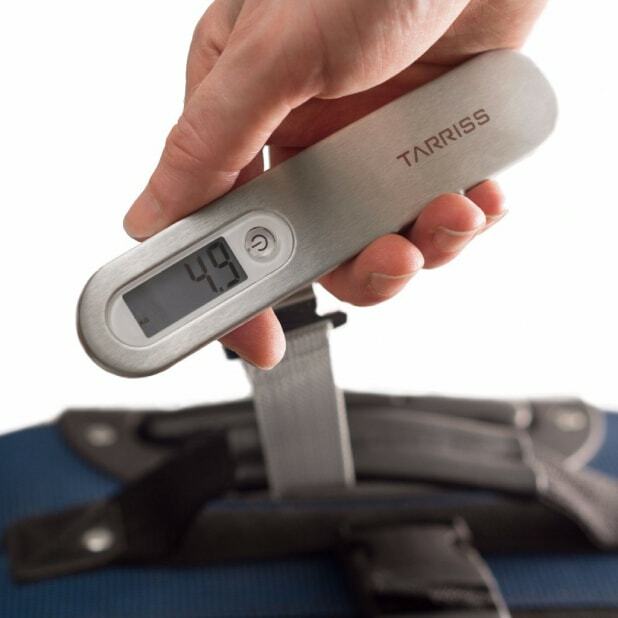 At 4 ounces, storage of the Tarriss Luggage Scale is not an issue, and it goes for USD 16.97. With Loop 3-in-2 Digital Luggage Scale, you are sure of getting a great deal, as you enjoy a wide array of products in just one gadget. First, there are the highly accurate scale thanks to the high precision sensor. You will accurately weigh your entire luggage in pounds and kilos and still enjoy an overload protection on bags exceeding 110 lbs. There is also the auto off feature, hold and low battery indicator, a big backlight LCD screen, an intuitive two-button design and ergonomic handle for easy handling. Secondly, a power bank will help you recharge your smartphone on the move. The power bank, controlled by a premium power cell uses a smart charge chip. Finally yet importantly, LED flashlight and a thermometer all charged by the rechargeable power bank. 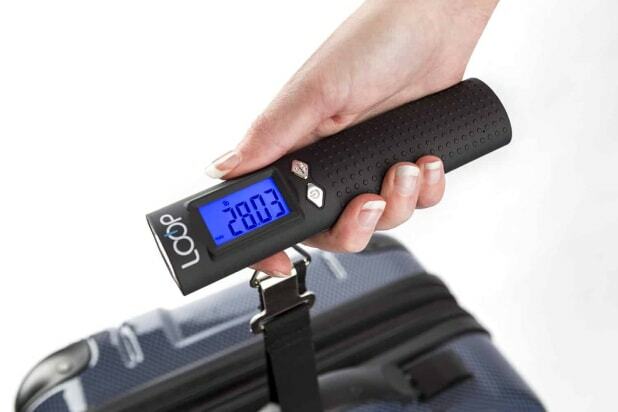 For USD 16.95, you will be sure of having the Loop 3-in-1 luggage scale in your possession. While light packing helps you be green since the transporting vessels will use less fuel when moving your baggage from one place to another. It is also important as a traveler you make an effort of avoiding surprises and embarrassments or repacking in public, especially if you cannot meet the extra weight charges. A luggage scale will help you meet the stringent weight restrictions imposed by major airlines, while also saving you the strain that comes with dragging your suitcases in airports or stations. Therefore, when buying a luggage scale, understand your travel needs, the additional features that the devices come with and the overall longevity of these delicate gadgets. A portable digital scale mainly encourages frequent travelers to pack less hence preserve the environment.